Email is a private experience. Unlike social media where comments are public email provides a safety zone for both B2B and B2C customers. What does that mean? You can receive an email, and take no action. Alternatively, a personalized email may be the tipping point that determines that you will make a purchase. According to a study from MarketingSherpa, 7 in 10 people have made purchases influenced by email marketing. Interestingly, that study also found that the vast majority that do purchase, are not just making purchases online. While it’s true that some businesses do not fit under the in-store or “over the phone” model, many do. A well developed email campaign will solve a pain point, inspire action and make you feel connected. Below are examples of some of the best email marketing campaigns that of this year (so far). Our team first heard of Sally’s fascination advantage concept when attending Copyblogger’s Authority Rainmaker conference earlier this year. If you want to determine the primary advantages that will allow you to communicate most confidently and effortlessly, all you have to do is complete a short quiz to find your type (visit: howtofascinate.com/you and use code: copyblogger). Once you’ve completed the quiz, you receive a chart which describes your different archetypes. But it gets even better! Based on your results, you’ll receive a series of customized emails that explain more about the advantages and disadvantages of your archetype as well as tips to help you be successful. What pain point does this campaign solve? Sally’s campaign provides insight into better understanding where we can be most impactful as individuals how to better communicate with our team members. Since completing my quiz in May, I’ve received a handful of emails that are specifically geared toward my identified communication style. The email copy is concise, impactful and actionable. Now that you have a basic understanding of your own archetype and a few helpful tips on how to play to your strengths, the logical next step is to have your entire team sign up to complete the communication exercise, and gain access to the full toolkit that will help you communicate more effectively. How can it make you feel? It’s almost like Sally is looking out for you and sharing information to help you be better. Each time I received an email I eagerly opened it to find out what I would be learning that week. Uber frequently sends out emails with special fare promotions, local events and information on the trips you’ve taken with them. The email below takes an entirely different approach from the Uber norm. Uber partnered with Capital One to bring warm Minnesotans a cool summer treat. Uber is offering $20 ice cream delivery to people who make a request on July 24 and are able to connect. Additionally, if you’re a Capital One member you have an opportunity to score a free ice cream delivery. It’s hot as blazes outside and you don’t have time to leave work and go grab a frosty frozen dessert whenever the craving strikes. 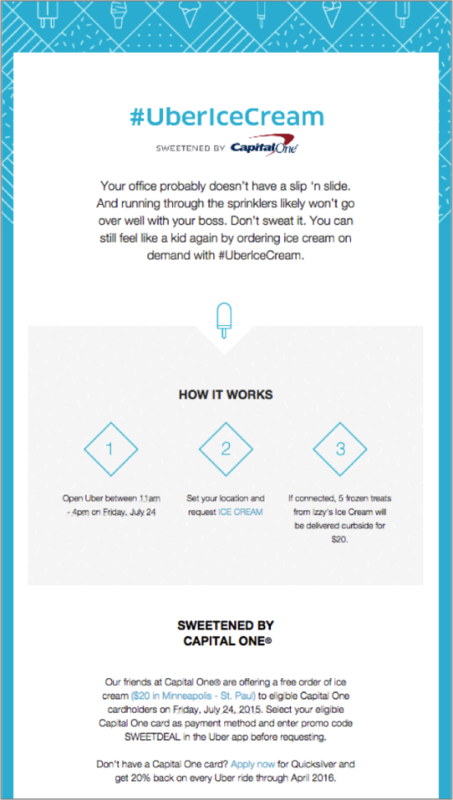 They’re making it easy and ok to eat ice cream in the middle of the day by delivering it right to your location. This campaign has seemingly nothing to do with hailing Uber for a ride when you’re in need of transportation. However, Uber is cleverly creating a great and unique experience that will keep them top of mind the next time you’re trying to figure out how to get from point A to point B. This campaign reminds me of the frenzy created when radio DJ’s announce that they have a front row pair of tickets for an awesome band that will be awarded to the tenth caller. I predict that many of Minnesotans will be furiously trying to “get through” to collect on their ice cream prize (even though it’s not free) on July 24th. While you may not be interested in $20 worth of ice cream, you’ll remember “how nice” it was that Uber was willing to deliver you ice cream on a hot day. Getting into an exercise routine can sometimes feel like a serious form of torture. One of the best ways to stay motivated is to exercise with a friend. If you know someone is depending on you, the chances that you’ll stick to your regimen greatly increases. Life Time Fitness took a conversational approach to recommend that you use one of your available guest passes to workout with a friend. All you have to do is mention the email at your visit. But wait, there’s more. If you can convince your friend to join, you both get some free Life Time Fitness swag, and 50 LT bucks that can be used on a variety of club services. Committing to a workout routine is tough. You should consider working out with your friends to make exercising more enjoyable and stick with your program. The casual air with which Life Time encourages you to workout with a friend, offers you free things and enlists you to recruit new members is nothing short of genius. Bring your friends to the gym, get them hooked and have them sign up permanently. I’ve actually convinced a number of my friends to join Life Time in the past couple of years since I’ve been a member. This one email had me thinking about my closest friends, and which ones would be the most fun to work out with. Also, I could really use a new pink gym bag. The subject line alone is enough to compel someone to open the email. Adobe’s campaign empathizes with every marketers need to be a better solution for their customer’s problems than their competitors. They are sympathetic to the fact that creating a steady flow of content isn’t easy, but they can help. Simply, helping businesses create a better user experience for their customers. Their customer centric approach (to the end user, not you the buyer) is brilliant. The message is focused on helping you service your customers better, which in turn leads to more customers (and more money). Download their white paper to access tips on creating a better user experience for your customers. Like I truly am getting a secret weapon that will give me an edge over my competitors. Are Your Email Marketing Campaigns up to Par? Sometimes it can be difficult to create email marketing campaigns that are optimized for the devices that your customers use, evoke creativity and inspire action. Each campaign that you create should provide value and give your customers a next step. What are some examples of email marketing campaigns that have influenced you to make a purchasing decision? Thank You for Sharing, creative and spot on! I really like your article Ashley 🙂 In my company I use GetResponse platform and I always remember about creativity an innovation. Ashley, did you by any chance try Outreach.io and ReplyUp.com to send follow up emails?